What is SEM and SEO Marketing? What is SEM / SEO Marketing? If you have products on Amazon that need more traffic the SEO Marketing Experts NYC can help you. Amazon works much like Google and other search engines when it comes to having products listed in their search results. The main difference is that part of Amazon’s algorithm is actual sales. Because of this new products have a very tough time getting ranking and older products that are selling well tend to stay on top. So makes us an amazon SEO Expert? Since mid 2014 we have helped several companies gain first page placement, and in some cases #1 for popular search terms on Amazon and the results speak for themselves. Amazon optimization can help your product listings rank higher than your competition. With proven SEO strategies for Amazon our Amazon SEO Consultants can help you get your products optimized and ranking better within a few short months. So if you are wondering how to rank on Amazon then you have come to the Amazon SEO Experts and we can help! The first company we worked with was “HC Collection” to promote their Duvet Cover. If you click the link below you will see the listing, generally in the top 5 against over 2 Million Duvet Covers sold on Amazon! 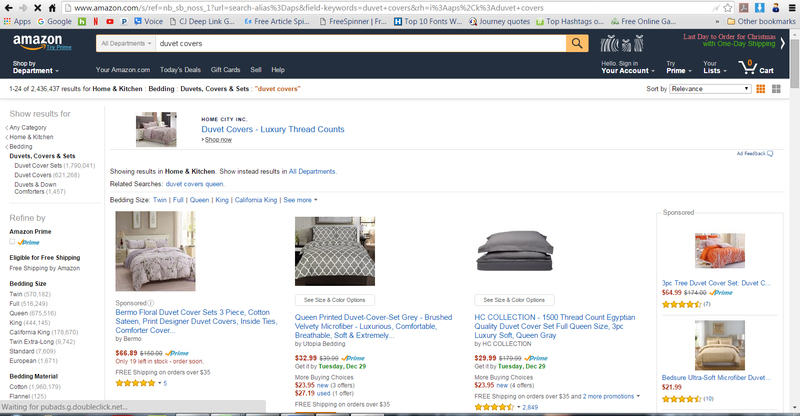 When our Amazon SEO strategy was used for the term Duvet Covers you can see the results. Just look for HC Collections. We did this with a specific SEO for Amazon formula that includes building a small external website as shown here: http://bedlinensnmore.com/ It is not fancy, but it is built in a special way to promote the Amazon page. We also make sure your page is optimized for Amazon and has sufficient back links to the page itself. You MUST be the owner of the Amazon listing, not just attached to it with no control over the description and other important data for our SEO for Amazon to work. So some might say, “Well, you got lucky” or “It was a fluke” – We couldn’t call ourselves the SEO Marketing Experts if it wasn’t true! We know how SEO for Amazon works, and more than likely you came to this page through Google after searching for “Amazon SEO Strategy” or “Amazon SEO Expert“, and most of the other results are just articles and Amazon SEO tips on what YOU MIGHT be able to do that may or may not help. See the excerpt below. The SEO Marketing Experts are Amazon SEO Experts and with a proven track record and can help answer your SEO for Amazon questions quickly and easily at 201.844.8778 11 am to 11 pm 7 days a week, EST, so call today, you have nothing to lose since we offer a FREE 20 minute consultation! In June 2015 we were handed the task to get the keyword wireless office headsets sold by Headsets.com. Yes, Headsets.com called the SEO Marketing Experts because they did not know how to get their best headset, The Sennheiser OfficeRunner, ranked on the first page with companies like Plantronics, At&t, Motorola on Amazon.com. After explaining to them the program, and what it takes to SEO an Amazon listing they understood we needed to build a site for the product and provide back links to “support the Amazon page”, they agreed and we built them http://best-wireless-headsets.com/ as well as optimized their page for the term wireless office headsets and many more. The end result after just a few months is when you do a search on Amazon.com for wireless office headsets, once again, our client is consistently in the top 3 positions, often #1 or #2. The biggest trick is knowing what keywords should be used on your page and what people are looking for. This is where the SEO Marketing Experts use a proprietary software to determine which is the best keywords to go after. We do extensive research into your product, the competition and give you a realistic opinion of how easy of difficult the product you want to promote will be even before we start. In some cases you will need just on-page SEO for the Amazon product. This starts at $200 per item and is a one-time free and good for 1 year of additional optimization should it need it over the first year due to competition also improving their pages. Most of the time you will back links, that is something we determine after we evaluate your product and how tough the competition is for the keywords you desire. This is based on competition but starts as low as $75 a month and rarely would ever exceed $500 per month for a given product and if it is a popular item it should get more than a few hundred clicks per month, keeping your cost per click within reason for most products over $100.00. For less expensive products, we have other options and discuss them more by phone or in person if you are in the NJ or NYC area. Finally, if it is a tough keyword like “Duvet Covers” or “Wireless Office Headsets”, you will most likely need an external website for us to use as a support to the Amazon page. We will discuss this further when the time comes but generally you are looking at less than $1000.00. For now, if you have a product on Amazon.com and want to improve the ranking and sell more, then call us today @ 201.844.8778 11 am to 11 pm 7 days a week, EST and we can answer your questions. We also offer % payment on certain products, ask if your product qualifies! DISCLAIMER: The external website and links must be built and set up to Amazons criteria and this is the formula we know and have proven time and time again. I’m sorry to hear that your product is not appearing when you do a keyword search on Amazon.com. Factors such as the history of buyer viewings, the sales history of an item, price, and current availability all influence the location which a specific product achieves in the search results. This means that products that sell better tend to be toward the beginning of the list. Therefore, as your sales increase you can expect your products to appear more frequently toward the beginning of the search results. Due to the factors above, Amazon.com cannot guarantee that the product you are selling will appear in the first set of search results. It is also important to note that when you search your listings by Product Name, the order of the words you are searching for will affect your search results. For example, if you would like to locate the title “Harry Potter and the Sorcerer’s Stone” in your open listings, a search for the key words “stone potter” will not return the title you are looking for. However, if you search for “Harry Potter,” the listing you are looking for should appear in your search results. Sometimes, you will not be able to quickly find the title you are looking for within our regular catalog search function. However, by using the Advanced Search feature, you can narrow your search using more specific criteria when trying to locate hard to find items in our Books, Music, DVD and Video stores. To use the Advanced Search feature, simply go to the store you wish to search within by clicking to view the category on the left side of the main page (www.amazon.com). On the following page, click on the “Advanced Search” link which appears just below the search box drop-down near the top of the page. You can then search by specific item attributes to locate the title in question. I have included a screenshot of where you can find the Advanced Search feature. BOOKS: Keywords, Author, Title, Publisher, Subject, Format, Reader Age, Language, Publication Date. Keep in mind that the Advanced Search feature is only available for media items (Books, Music, DVD and Video). When you create a product detail page, it should appear on the website within fifteen minutes. However, it can take up to four days before a product’s title and keywords are searchable, even though you can find the product earlier if you search by ASIN. Note that our search engine will not start creating title or keyword searches until after you create a buyable listing for the product. Newly created product detail pages will be searchable just as any other pages on our site. Our search engine will provide matching results for keywords, including title, author, publisher, ISBN/ASIN, and manufacturer. (It is not possible to search by UPC.) Any other search functionality that exists for Amazon.com pages will work for new pages, such as matching for actor in a video or DVD. Note: in order for your page to be searchable, you must create a Marketplace listing for the product. Because Amazon’s search results base the ranking on sales, a brand new item with no sales will need a way to generate traffic and sales other than Amazon’s search engine if it is a very popular item. If the item is a staple item that many other companies also sell on Amazon then you may notice the competition for price is often very stiff and it is very hard to make anything once the fees have been added in. This is where the SEO Experts can help you to find the right products to sell on Amazon and which to avoid. See REAL Amazon SEO Results from current clients like Headsets.com, HC collection, Dr. Joshua Shifrin, all with first page placement for their product on Amazon.com! Only the SEO Marketing Experts NYC know the secrets to SEO Optimization on Amazon! Looking for an Amazon SEO Expert? We have a proven Amazon SEO Strategy and as a professional amazon SEO service we can provide you with the best SEO Amazon listings. Call us today about Amazon product SEO and SEO optimization for your amazon store, we can help with 1 to 1000 products or more!